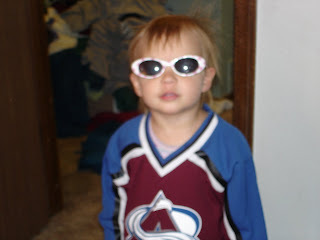 Beautiful baby girl... Laila JeanneLi: I love this blogging stuff!! I can tell I will become addicted to this!! The hardest part is actually deciding what to write... alot of people will be reading this and I don't want to be a dork!! This post will have alot of different things in it, a hodge-podge if you will. The question we get asked the most is, "When will you get Laila?" That's a good question and I wish we knew. We THINK we will have our referral for Laila by Christmas, possibly sooner. What a great Christmas present that would be!! We will travel to China about 2 months after our referral for 2 weeks and come home with our daughter!! 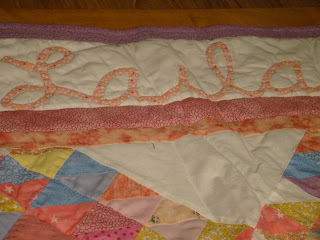 A friend of ours who I work with, Sandra, made this quilt for Laila and we think it's beautiful!! My mom-in-law, Norma, helped me pick out the fabrics and I'm very grateful for her help. We love our quilt. Luckily we have many blankets and another quilt for Laila to actually use so this will probably be a pretty and eventually end up in a chest. Last summer our brother-in-law, Guy got a job here, yeah!! That means Scott's sister, Kate, Guy and the kids, Nick age 9 and Gabrielle, age 2 moved here and we are so happy!! They lived with us for about 9 months and then in May bought a house only a few blocks from us. We are really enjoying watching the kids grow and just being close to family. Last Thursday Gabrielle turned the big 2. She's a ham and absolutely adorable. She's talking more and more everyday and I love watching her vocabulary expand, reminds me to watch my vocabulary. :o) Here are a few pictures from her birthday party last Friday. This picture doesn't do justice, she looks mad or something but she's actually saying cheese for the camera. 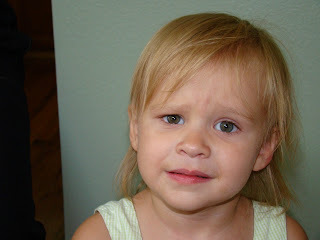 Whenever she sees a camera she says cheese so this is the look for the pictures. 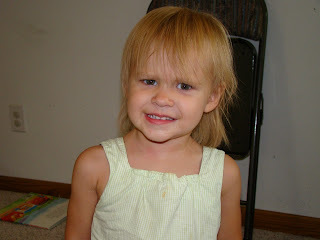 Here she is again, I'm gonna post another picture from before she said cheese all the time cause she is a cutie!! Here she is, what a cutie!! Here's my nephew Nick and my hubby Scott. 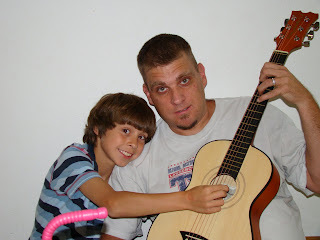 Nick is going to be taking guitar lessons and was showing off his new guitar. It's very nice and he's excited. Nick is the sweetest little boy and he's wicked funny. He's letting his hair grow a little longer because it's a girl magnet!! What a ladies man!! His dad is proud, so is his uncle!! I just think this picture is so cute of Nick!! 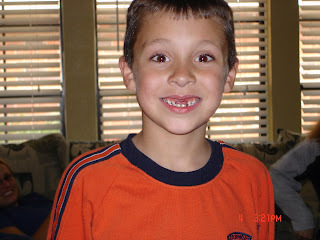 He had just lost his 2 front teeth and was so proud!! 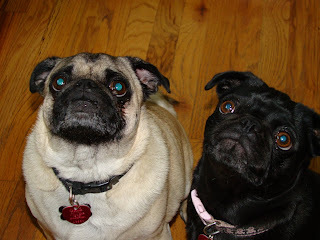 Gus, on the left, is our nephew pug and Cassie, on the right, is our niece pug. We love them. One more thing... I need to give a HUGE thank you to my friend Kelsey. She helped me put together our blog and I couldn't have done it without her help!! Thank you Kelsey!! Her blog is on the left and it's really cute! She and her husband Mike, my work husband, have 3 year old twin boys and a 5 year old girl so it's always fun to keep up with their family. There's tons more I could add but I will save it for another day. Check back often, I will be adding more!! Look forward to getting to know ya. Gabrielle (it's funny to typre that since I'm used to adding an "a" on the end) looks more and more like Nick! 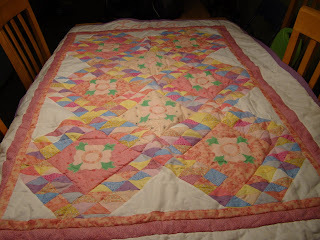 I love the quilt BTW - that is just awesome! I LOVE your new blog! You're right you will get addicted! It's so much fun -- and just think how much you'll have to share with Laila!!!! I'll be following along! Oh and THANK YOU for listing me on your site! I am honored!!!! Welcome to the fun world of blogging. Your blog looks great and the blanket for Laila is precious.